ASABAâ€”GOVERNOR Ifeanyi Okowa of Delta State, yesterday, warned against using oil surveillance contract as a ploy to cause trouble in the state, saying such could cause more economic challenges in Nigeria. 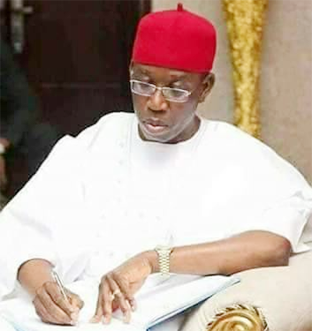 Okowa, who gave the warning while addressing over 1,000 aggrieved ex-agitators of the Federal Government Amnesty Programme and youths from host communities of OML 30, who protested at the Government House, Asaba, said his administration would take necessary actions to address their grievances. He said: â€œI want to advise that whosoever is plotting against the people, should allow Delta State to remain peaceful, because, in peace, we will be able to produce and export more crude oil. â€œIt is our hope that nobody, especially as the oil prices are going down should take any action that would foil the quantity of oil that we are currently producing. I want to thank you and appreciate you for the way you have put yourself together. â€œI want to appreciate you for deciding to make the protest peaceful. That is the hallmark of Delta youths. We are knowledgeable and we know that what is right is what should be done. â€œThis protest is happening on a day we are holding our Security Council meeting and the security agencies are here. â€œThe agencies have been working hard with the support of our people to keep the Trans Forcados line safe and we thank God that because of the safety of that pipeline, oil production in this nation has increased. â€œWe have held a series of meetings with stakeholders and we have long agreed that it is best to secure our pipelines when we are in charge. â€œThe people, who own the place know how best to protect their property and since June 2017 that the Trans Forcados line has been open, it has been functional and our oil production and export have continued to increase.